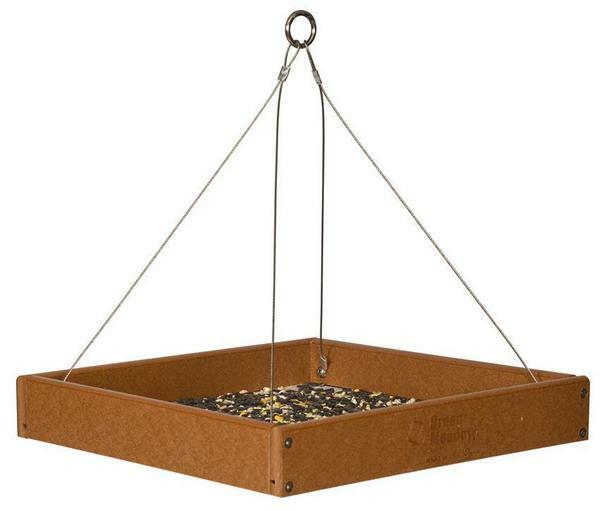 Bring the glowing cardinals to your garden with our Amish Poly Fly By Tray Bird Feeder. Watch as they fly and dart about, finally coming to rest on this hanging bird feeder tray for a snack! Made from Eco-friendly Poly Lumber, the available colors for this feeder are Cedar, Cherry Wood and Bright Red. Our Bird Feeders are handcrafted at a woodshop in northern Indiana and are made of Eco-Friendly Poly Lumber that is maintenance free! Consider our Swing style bird feeder for another fun option!